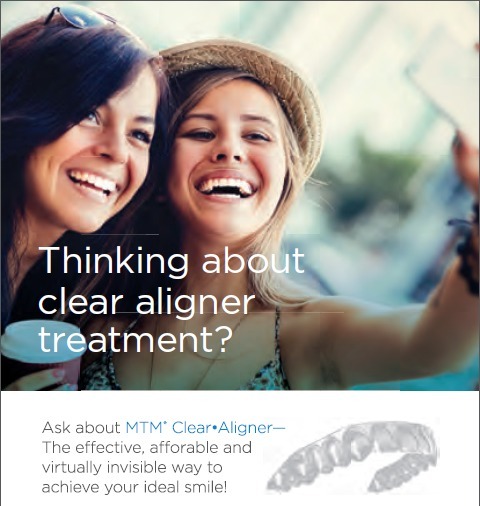 MTM Clear Aligner is the virtually undetectable way to achieve your “IDEAL SMILE” without traditional braces. The MTM Clear Aligner system aesthetically aligns teeth, to correct slight misalignments such as crowding or gaps. Each aligner is custom fabricated, per your doctor’s treatment plan, to progressively advance your teeth into their IDEAL position, leaving you with a healthy and beautiful smile. Results are achieved in a fraction of the time and cost of many other aligner or bracket treatments, including clear braces and invisible braces. Properly aligned teeth contribute to maintaining healthy teeth and gums, and can help prevent more serious health problems. Misaligned teeth can lead to stress on the jaw muscles and excessive wear of the enamel, negatively affecting the long-term health of the teeth and their supporting bone structure. Crowded or gapped teeth can be difficult to care for and can lead to periodontal disease with associated gum and bone loss and in some cases, the possible loss of one or more teeth. When it comes to orthodontic treatment, comfort means more than just a good fit. It means your treatment must also fit your lifestyle. Unlike some clear aligners, MTM Clear Aligner is fully removable, with no unattractive “attachments” on your teeth that can make it hard to properly fit in your mouth. There are no special brushing or flossing techniques required. Simply follow your normal oral care routine, recommended by your dentist.